Home BUSINESS EQUITY Chairman Peter Munga calls it a day, hands over the reins to David Ansell. EQUITY Chairman Peter Munga calls it a day, hands over the reins to David Ansell. CHANGE OF GUARD: Dr. Peter Munga has handed over the reins of power to David Ansell in a nostalgic event at Kangema town, Murang’a County. Dr. Peter Munga has called it a day at the helm of East and Central Africa’s biggest bank, Equity Bank, after a 35-year tenure. In a nostalgic event at Kangema town, Murang’a County, Dr. Munga addressed residents outside the office where the bank first opened its doors in a small room in 1984. However, the crowd got uneasy as he introduced the new bank’s chairman Mr. David Ansell and handed over reins of power though he managed to convince them that they were in safe hands. “I know it’s difficult for those who have travelled this journey with me to come to terms with my exit. But I assure you that Mr. Ansell will work closely under my mentorship,” said Dr. Munga. 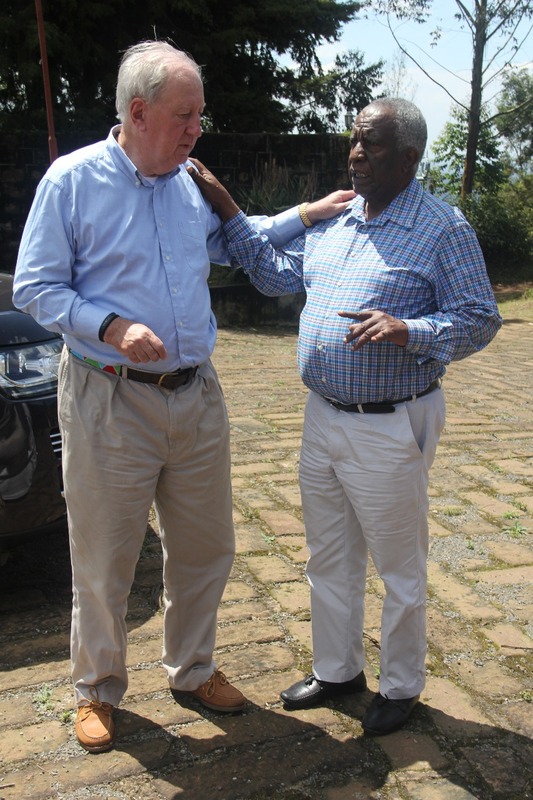 Dr. Munga recalled that his drive to open the bank was necessitated by the challenges he experienced as a young man as well as the hardships experienced by women from his village who included his late mother Beth Nyambura as they received their proceeds from tea harvests. “Banks then never accepted customers whose accounts fell below Sh. 10,000. This forced my mother and other women to travel all the way to my place so that I could cash these cheques on their behalf,” he said. At the age of 20 years, he took the challenged and decided to bridge this gap by opening a Sacco that he named Equity Building and Housing Cooperative Society. institution’s manager. He then introduced Mr. Ansell to the Murarandia branch which was their second branch and then their third branch at Kiriaini. The reception of this new initiative was so drastic culminating in the introduction of more branches before the Sacco later transformed itself into Equity Bank in 2014. “In fact, we were overwhelmed by the numbers we got at Kangema, pushing us to open a second branch at Murarandia shopping Centre and a third one at Kiriaini in Mathioya Constituency. In all these stations, we had quite a big number of tea farmers,” he explained. Dr. Munga concluded by expressing his joy at achieving his childhood dream. He added that he had great hopes in the new leadership whom he tasked with the duty of listing Equity Bank in both the London and New York Stock Exchange. While addressing the same gathering, Ansell admitted that it was a quite an enormous task to fit in his predecessor's shoes adding that the task ahead was enormous. However, he promised to take the bank to the next level and ensure it had branches across Africa and the world. "I have never ever dreamt that the board will have the courage to choose me as the chairman of Equity. I have known the chairman for close to 15 years now and I must admit that it is a scary thing honestly to fit in his shoes. He cannot be replaced. Currently, Equity Bank has 294 branches with a customer base of 12.5 million and has spread its wings to six countries namely: Kenya, Uganda, Tanzania, Rwanda, South Sudan and DRC. The bank has an estimated total assets amounting to US$ 3.21 billion (KES. 284.37 billion). Thika Police Trained On Child Protection Issues. 59-year old woman murdered in Gachagi. Kiang’ombe man stabs wife to death over food. Notorious lady bhang peddler nabbed.